It’s reassuring, too. I mean I know I’m home and I love being home. Everything is so familiar I could walk through the house blindfolded and find my way around. An example of this is in how I walk down the stairs. I always reach for a certain place for support and was surprised, pleasantly, to find myself doing it the first time I came down the stairs. It’s the same for moving about the kitchen, or looking for something in the bathroom. I don’t have to think about it. I just do it. Switching gears, Melinda and I head in to PSCS tomorrow, the first time there in 13 months. Unto itself that’s an odd feeling. But I have a hunch it won’t take long to kick things into gear. After all, it’s pretty darn familiar. Last fall, the Boudeaus, Melinda & I talked about the possibility of Romain coming with us to spend several weeks in Seattle when we returned. Not only would he get to practice his English, we’d see about setting it up so he could see some Seattle area businesses in operation. You see, Romain is studying economics in school. He is at a high level, what is called “Prépa” in France. Hooking him up with people we know who work at Microsoft, Amazon, and Boeing would provide him with some incredible learning opportunities. Most significant of these, my brother Scott, a financial advisor/stockbroker of some repute, early on greed to allow Romain to shadow him for several mornings. As our departure date from France grew nearer, Melinda and I started to realize that having Romain with us would provide our family something that’s a little hard to explain. His presence would literally bring back a human piece of France in our home and keep Melinda, Chloe, Ella & me from mindlessly falling back into our Seattle routines. With him, we’d speak more French, be able to show off our Seattle lives, and otherwise have a Nantes connection. He would be tangible evidence that our year in France was not a dream. His presence has so far been even more significant that we first imagined. I’m late posting tonight because we just got back from a late dinner at my brother’s house. That’s Romain with Scott and Sally, Scott’s partner. Also in the picture, two bottles of wine, thank you gifts from the Boudeaus to Scott. Not pictured, Romain’s new Seattle Mariners t-shirt that he picked up at today’s game. When I was a little kid and my family was on our way home from a vacation, I’d have this crazy image pop into my head. We’d be in the car, having driven for hours, and be nearing the house. I could hardly wait to turn the corner onto our street, sure that the neighbors would have put up signs welcoming us home. They might even be out in their yards, smiling and waving as we drove past. So imagine my pleasure yesterday when we got home and found this poster up in our Seattle house. Yes, we are safe and snug back home. Time-wise, from the point leaving the Boudeaus on Thursday morning at 5am (Nantes time) to walking inside our house just before 8pm (Seattle time), we had been traveling for 24 straight hours. With the 9 hour time difference factored in, our Thursday lasted 33 hours. Graphically, it felt like someone had taken both ends of the day and pulled on them, just like you’d do with some Silly Putty. It got long and thin, and even cracked in a few places. But overall it stayed together. Note, I am going to continue to post daily here on the blog, sharing about our transition back to Seattle. Look for that to begin tomorrow. Oh, by the way, it never happened. None of our neighbors ever put up a sign. In honor of our return to Seattle today, I thought I’d try something new. I’ve picked four of my favorite posts over the last year and want to encourage you, my beloved blog readers (I’m not saying which is beloved, the blog or the readers) to vote on YOUR favorite from these four: Day 12, Day 121, Day 192, Day 307 (click on the “day” to see each candidate, but vote on one below). Great photo here, don’t you think? It caps the trilogy of photos and posts from the last three days intended to salute the French families we feel have become part of ours. So yesterday I mentioned the family photo shoot Melinda, Chloe, Ella and I like to do each year. I said we choose the photo we like best and enlarge & frame it, and put it up in our home. We followed the tradition this year in Nantes; in fact, you can see this year’s photo in this post from Day 105, our 100th day in France. Today’s blog picture comes from our recent photo shoot with the Boudeau family. If you’ve followed the blog for any length of time, you know it was the Boudeaus whose presence in Nantes inspired us to move here. It was the Boudeaus who found our house for us, negotiated with our landlord, found Ella’s school, helped us with our French bank account, etc, etc. Today Frédérique helped us again with our French bank and helped get us checked out of our house. In short, I can’t imagine what our sabbatical would have been like without them. On our last full day in Nantes, the day we move out of our house (we’re spending the night at the Boudeau’s house tonight and then being taken by them to the train station at 5am tomorrow), I salute the Boudeaus, now permanently part of OUR family. Last August, soon after we moved in to our Nantes house, we staged a “photo shoot” for the four of us on the back patio and got this picture. This is something we like to do a few times each year, hoping to capture what we call our “album cover” portrait. Each year we choose our favorite of these pictures, have it blown up big, frame it, and put it up in our house. I referenced this once in a post on the Kind Living blog. This month, before leaving, we wanted to replicate that August photo shoot but this time include the members of our “French family,” getting photos that include us with the Bertails and others that include us with the Boudeaus. I’ve chosen to feature pictures from those “shoots” today and tomorrow, our last two full days in France, to honor and express our appreciation for these families. Today’s photo features the Bertails. Meeting them has been one of those experiences that demonstrate one is on the right path. The kindness of their entire family, from Bernard’s stately presence to Claire’s bubbly smile, has been a gift to us of enormous proportions. We are proud to count the Bertails as part of OUR family. We leave in less than 3 days, meaning we have very little time left to get ready. A big part of this is getting our suitcases packed, and a big challenge to this is keeping them under the 50 lb weight limit. We are each allowed 2 large suitcases to check, plus a small carry-on bag and then a purse or laptop bag (I haven’t yet decided whether to call mine a purse or a laptop bag). I brought the bathroom scale downstairs in order to place it on a large flat surface for uniforming weighing. I told Chloe that I thought we should try multiple ways/weighs. She didn’t laugh at all; in fact, I think she rolled her eyes. If not that, she just looked aweigh. The most consistent style of weighing was setting each bag on the scale by itself, as opposed to me holding them as illustrated in today’s picture. It’s kind of funny how we fine-tune each bag, moving an item from one into another in order to best make use of our weight allowance. One advantage we have this time around as compared to our trip to France is Romain is coming with us. He has the same baggage allowance but doesn’t have so many things since he is just staying in the US for a month. We’ll be using his second bag. Okay, here is one of those pictures I mentioned in yesterday’s post, the one in which I so rudely ignored all the great photos and story possibilities in favor of posting a picture of me at a racetrack. You just have to understand that I have my priorities. So, yes, yesterday we spent a couple of hours at the newly remodeled racetrack in Pornichet, having had a wonderful lunch at Luc’s & Isabelle’s house. Then after the races, we drove into town, parked, and went for a long walk along the beach. We stopped at a strategic point for this photo, taken by Luc’s sister who was with us (L-R: Luc, Isabelle, Laurent, Melinda, Frédérique, Andy). Back at home in Nantes today we are cleaning and packing, readying ourselves for our move back to Seattle. It’s all feeling a bit surreal. I was cleaning the shower and reminiscing on the day last year when the owners of our home were first showing us around the house. Was that really a year ago? Perhaps it’s a little bit selfish of me to choose this photo today, especially when I have several others from our day trip to Pornichet and the city’s new racetrack. I mean I have a nice shot of Laurent and his friend (and our day’s host) Luc cheering on their selections in an early race. And I have a lovely picture of Luc and Isabelle, his wife, just outside their house. Then there is a group shot of Frédérique, Laurent, Luc, Isabelle, Melinda and me during our late afternoon walk along the beach with the Atlantic Ocean behind us. But I choose this one of me with racehorses. Yup. Selfish. On July 24 last year, a year ago tomorrow, when we were staying in Pornichet, I wrote about the construction of the racetrack. I lamented that we had arrived in Pornichet a year early. Then the opportunity came for us to go today, thus closing this tiny gap in my France experience. Laurent & Frédérique set it up and agreed to drive. Luc & Isabelle provided an incredible lunch. And they live so close to the racetrack that we could easily walk. Turns out it was a special day at the track, too. Free admission, pony rides for kids and more. Laurent was the big winner, clearing 60 centimes on his betting. As you can likely tell, I took this picture right after I took the one I used in yesterday’s post. I have been imagining at least one person (my mom) reading yesterday’s post and saying something to the effect of, “But I can’t see their faces!” So here they are, Zacharie and Luce, in all their glory. Let may say it again. These are adorable children. And they speak fluent French. Go figure. I’ll tell you, there are few things cuter in my world than hearing a small child speak French. Luce, especially, just melts my heart. Chloe has a video of her singing, too, that is priceless. If listening to a small child speak French is cute, hearing one sing in French is over the top cute. Given both parents are professional musicians, there isn’t much surprise that Luce has some musical ability. Switching gears, today Melinda and Christine went out together for lunch. Back at home, Chloe tried to coax the sun out from behind the clouds by sitting by the pool. It didn’t really work. For you Seattle folks, the last couple of weeks in Nantes have mirrored the weather we hear you’ve been having. Ella finished up Book 9 in her math series, meaning she’s right on track. Me, I cleaned the pool. In a few minutes, Laurent and Frédérique are picking up Melinda and me. The four of us are heading to a garden party at the home of Alice’s parents. Chloe is going out with a girlfriend from China she met at the University of Nantes. Ella has a date with some fan fiction, I think. It’s astounding to me the mix of emotions I am feeling as we near our departure date from France (a week from today). I’ll be communicating with someone from Seattle and get all excited to be home. For instance, I talked to my parents by phone yesterday and exchanged email with Steve, a co-worker at PSCS, and felt the build-up of excitement that comes with looking forward to an anticipated event. Then today we were invited over to the house where Chloe did most of her babysitting this year to say goodbye to Zacharie and Luce, the incredibly adorable children she took care of, and Penny, their mother. The profound sadness I felt in saying these goodbyes is palpable. When we arrived, Penny and the kids had decorated the house, baked a cake, and created a beautiful table complete with strewn flower petals. The kids provided bissous all around, something I will never tire of from children and will desperately miss back in the U.S. Chloe had made special videos for each child of their year together. Since Penny’s DVD player isn’t working, we all came back to our house to watch them. I don’t think there was a dry eye among the older set as we watched. Luce and Zacharie just had ear-to-ear grins watching themselves on TV. Today’s photo is of the two kids sitting at their table in their house, having just been served cake and grape juice. I snapped this picture just as they clinked glasses. This was a complete surprise to me, watching a 6 year-old and a 4 year-old touch glasses before eating. It was beyond sweet and undoubtedly contributed to the emotion I am feeling tonight. Chloe seemed to catch on first, then Melinda. To a certain extent, I’m still trying to figure it all out. Here’s what I’ve got. “Souci” sounds a lot like “sushi,” part of what makes this funny. Literally translated, “souci” means worry. So the expression “pas de souci” means “no worries” or “no problem.” Suddenly, anything anyone at the table said got a “no problem” (“pas de souci”) response. It has gone down as the expression of the day. In fact, I think it’s one I might remember. Okay, maybe you just had to be there (and, as in my case, there is no guarantee that you would catch on too quickly). Say, it’s my mom’s birthday today. I talked to her earlier and promised we’d toast her birthday at dinner tonight. Chloe took the picture (and I’m back manipulating pictures, as you can see). And sorry, mom – we chose beer over red wine to go with the sushi. Day 20 (20 July 2010) – Happy Birthday, Carib! All the other images for this month I’ve been manipulating with an online photo enhancer called Be Funky (I’ve been using the “Underpainting” feature found in the “Artsy Effects” section, if you’re interested). I decided that today’s photo deserved to be left as it is. Actually, I didn’t want Melinda telling me that I messed up such a good photo. This photo is from last Thursday, July 14, when we went with the Bertails to see the Bastille Day fireworks in Nantes. I suggested to Melinda & Christine that they pose for me so I could have a picture of them together. Seconds after I took this one, Christine leaned over and planted a big fat smooch on Melinda’s cheek. I was late getting THAT photo. If I had gotten it, you can bet I would be using that on the blog. For Melinda, it goes without saying the importance Christine has in her life. I mentioned recently that she is easily the best friend Melinda has made since we’ve been married. Beginning last summer when Melinda helped Christine with her kitchen remodel, the two have spent hours together. Right now they are involved in a series of workouts each morning. I’m sure they plan to continue this with Skype or something. Day 19 (19 July 2010) – Bikes! I went to Orange with my wife (in French that is “femme”). We went to make sense of our cellular phone. He gave me his card that said his name, it was Saad. Three hours later I think he was mad. You see, our phones were a mess, wound tight like a clock. We wanted them free but they wouldn’t unlock. Saad called up Nokia, he called up his boss. In the end all he could say was that he’s at a loss. Saad is still nice; in fact, nice, kind and smart. My wife is concerned ’cause our friend’s in misuse. And me, all I can do is make rhymes like ol’ Seuss. And decided it rests in trying to be arty. But just like today, I think it’s been a gaff. A year ago today we had a crazy, crazy day. Not knowing Nantes very well, we walked from the Boudeaus to catch Line 1 of the tram, a fair distance with the luggage needed for two weeks in Pornichet. We took Line 1 to the train station, our first of what has become many uses of the station. But on July 17, 2010 it was all new to us. How funny that seems now. The biggest deal, though, was not objecting when people on the train wouldn’t relinquish seats to which we had tickets. What did we know? We were Nantes newbies. Today has been a much calmer day, spent indoors due to the windy and rainy weather that is persisting. Other than a morning run, during which I got drenched, I’ve been organizing the Tom Waits section of my iTunes library. This is a significant task, mind you, Tom Waits being one of my favorite singers. Melinda has been doing laundry, and Chloe & Ella have been tying up some of their own loose ends. Today’s photo is from a Line 2 tram stop. The orange sign is indicating that from July 22 to August 21 several stops will be closed while construction work takes place. A bus will move people from stop to stop. You might remember this from last August. In fact, there is much roadwork taking place in Nantes, the summer being the best time to do it. John’s family will be heading out on Wednesday for a little vacation, meaning this is the last weekend we’ll be seeing them. He and Ann-Marie had suggested having the Bertails and our family over one more time before they go, but Bernard and Christine were having none of that. They insisted it was their turn to host so we all met at their house last night for a BBQ dinner. While the older adults (I’m referring to those who qualify as parents as opposed to the younger set that included a couple of 18 year-olds) chatted around a table, the kids and younger adults (yes, Christine does qualify as a “younger adult” but was disqualified from such status here based on being a parent) all climbed on the trampoline and started tossing a ball around. I risked my membership in any group by separating from the older adults to take this picture. That’s the ball leaving Ella’s hands. Moving to her right you see Benoit, Céline, Celeste, Alexandre, Claire, Maxime and then Chloe. Théo was absent, having been out of town with a friend for a few nights. I’m not going to try to explain what a “kebob” is in France. But it’s NOT skewered meat and vegetables like Bernard served last night. Whatever it is called that Bernard fixed, it was delicious. Christine again proved her baking wizardry by providing brownies. Chloe & I have dubbed them “Crack Brownies” due to their addictive nature. Christine prefers the name “Pin-Up Brownies.” I’m thinking I might just call them “Kebob Brownies.” Believe me, they’d still taste just as sweet. All humility aside, let me just say that I really like this picture. Framed by the huge plastic blow-up Nantes arch, I think I look like a man who has spent the last year relaxing on sabbatical in France. I’ve got a little tan going (true) and I look like I’ve lost some weight (also true). With some pleasure, confidence and excitement I can say it’s about time to head back to Seattle. Melinda took this picture using my cell phone. It was taken along the path we’d walk to take Ella either to or from school, right next to the Nantes racetrack. In fact, I’m standing on a gravel path that is often used for overflow parking for the track. The crazy blow-up arch, and many other things, were placed here as part of a three day fair of some kind. It’s like paradise for kids. Go-carts, archery, a climbing wall, ropes course, mini-soccer and more, including a stage for live music, have all been set up here for summer fun. Melinda and I had fun just walking through. It’s French National Day in France, Bastille Day or le quatorze juillet. To this point, we haven’t done anything special to celebrate but we are thinking of heading in to town for the fireworks show later. Last year we watched it from the balcony of the apartment at which we were staying. But the apartment was much closer to town than where our house is so to see anything we’ll have to leave the house. The small problem with that is public transportation is on an abbreviated, holiday schedule. What we’ve spent most of the day doing is lounge by or in the pool. In preparation for the effort involved in such lounging, I went for an early morning run while Melinda worked out with Christine. For you Seattle folks, we are intending to come back with some serious tans. Chloe commented that on days like this Nantes feels like California. Another thing happening this month is me spending time each weekday morning (including this morning) working with Ella on algebra. She had completed half of a year-long high school course at PSCS before we left and wants to complete the second half before school starts in September. She’s well on her way. Tomorrow she will have completed the eighth of ten workbooks she needs to finish to meet her goal. Today’s photo shows her graphing linear equations. Here are Chloe and Ella, off on a shopping excursion today, just the two of them. Chloe learned that Ella had not yet been inside the Nantes chateau so set about rectifying that oversight. Before that, the girls did some shopping. I know Chloe came back with some shoes she’s been wanting. You may be asking why she’s buying more items so close to our departure from France and you’d have a point. But I think the answer has something to do with not being able to get THESE shoes in Seattle. I volunteered a few Euros for the girls to get some gelato, which they gladly did at the yummy gelato shop in town. Chloe raved about it afterwards, saying it rivaled what we had in Italy. That’s saying something. I’m writing while sitting next to Frédérique and Laurent who came over, along with Romain and Manon, to watch the US-France women’s World Cup match (won by the US 3-1). Minutes ago, Chloe took off with Romain and Manon to see he new Harry Potter movie which was released in France today. Ella declined an invitation to go along, preferring to wait to see the movie until she can see it in English. Day 13 (13 July 2010) – Happy Birthday, Al! A year ago today I posted a “Dear Jane” letter to Melinda, having fallen for the lovely young woman who was working last summer at a bakery near the apartment at which we were staying when we first arrived. It’s been a year since I’ve seen her (the baker woman, not Melinda). I decided that I’d go back today to see if she’s returned. In fact, when I asked the young woman working the counter today if I could take a picture (I envisioned using a shot similar to last year’s), she retreated to the back and returned with who I assume is the owner. She explained (in French) that she doesn’t allow pictures to be taken inside the bakery. In fact, she all but demanded to see the photos I’d taken of the exterior. Apparently, she saw me taking them from across the street (and, yes, that’s the tram, Line 2, on the right of the image). As you might imagine, no one told me that the pain au chocolat I bought today might burn my tongue. Yesterday I wrote about Frédérique & Laurent, commenting that if it wasn’t for them I don’t know where we’d be. Today I’m writing about Christine & Bernard. Without them, I don’t know where we’d be. Meeting Christine & Bernard is going to be one of those lifetime memories that are easy to chalk up to dumb luck. But since I really don’t believe in dumb luck, I chalk it up to something more profound. It’s like something that was just meant to be. For Melinda, meeting Christine has been like being introduced to your long-lost sister. To put it frankly, Christine is the best friend Melinda has made since I’ve known Melinda (and we’ve been married, in case you didn’t know, for over 20 years). Bernard is just one of those people that you feel comfortable with right away. That they have been so kind and generous and helpful, and live just a couple of doors away has been the literal definition of a God-send. Indeed, Christine did stop by, the first two times finding Chloe and Ella alone at home. She jokingly concluded that the whole “living with parents” thing was a ruse designed by two teenage girls to live in France alone for a year. A year ago today I posted a picture of a bottle of beer and lamented my difficulty with pronouncing the French “R.” Some things have not changed…. Here they are, Frédérique & Laurent Boudeau! If you can, please hold your applause to the end. No, go ahead. I’ll wait for the excitement to quiet down a bit. Indeed, the Boudeaus are worthy of Melinda’s, Chloe’s, Ella’s and my applause. 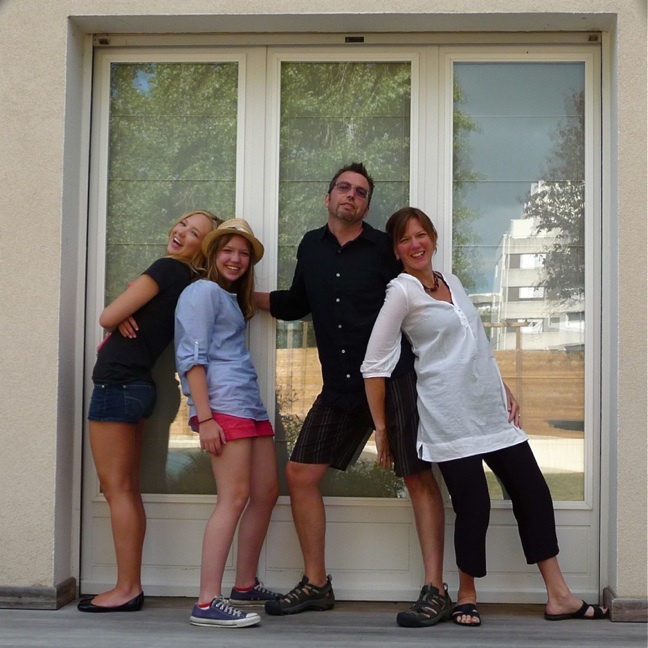 If it wasn’t for them, we would not be in Nantes, we would not have had this amazing house, Ella would not have attended Le Loquidy… The list goes on and on. So just why were the Boudeaus thanking Melinda and me last night, taking US out for a fancy dinner? Perhaps it was to thank us for letting them do so much for us? Come to think of it, it was mighty nice of us to provide them the opportunity to be so thoughtful and generous. I mean, who knows, without us there is no way they would have had so many chances to earn their angel wings. Right? Right?! The dinner was delicious, of course. For you Seattle area folks, the restaurant is something like the Herbfarm insomuch as the vegetables are all grown by the chefs themselves. We had three courses and Laurent chose the wine. What could be better than that? The weather remains decidedly un-summer-like, affording us the opportunity to start the laborious, sad and somewhat exciting process of getting ready to consider the prospect of some day moving out of our Nantes house. Today’s photo is a self-portrait taken by Chloe that includes quite a few of her clothes, rolled in preparation of being placed in a suitcase. If it’s hard to figure this out from the photo, here are some viewing instructions. First, locate her legs and feet at the top of the picture. The presence of these indicate a mirror. Below her feet and on the floor are the rolled clothes, doubled in number because of the mirror (although to the rest of us it’s not surprising to think Chloe may actually have twice as many clothes as she does). Adding to the artistic nature of the photo is Chloe’s laptop (upper left). Melinda has been organizing the office, sorting through paperwork to determine what needs to be brought home and what can be recycled or trashed. Like Chloe, I went through my clothes but did not begin the process of rolling them. I just decided what I’m taking and what I’m getting rid of. Ella bought a book on iTunes (something with Chloe in the title, I think, a new TV show, perhaps?). So that’s how we spent the day. Tonight the girls are heading to the Boudeaus for a pizza dinner with Romain and Manon. Laurent & Frédérique are treating Melinda and me to a dinner out, a thank you for our English “lessons” with Romain and Manon during the school year. Ella, Melinda & I just returned from a late Friday afternoon excursion to Leclerc. Nothing out of the ordinary to report about this; in fact, today has been about as ordinary of a day as it gets. Well, ordinary for a chilly, rainy day in July. As we waited for the tram to come home, Melinda commented that we seem to have gotten our summer in the spring and right now are getting spring in the summer. We hope this turns around again soon. I have seen that it’s supposed to start warming up again on Sunday. Anyway, as you may be aware, Leclerc is a large grocery store. Several aisles are devoted to the sale of alcohol-related products. Of course the wine selection is huge (this is France, you know). The beer selection is small (this is France, you know). But of interest is the wide variety of hard liquor available. For Washingtonians like ourselves, it takes a little getting used to, seeing hard liquor in grocery stores, although it sounds like that might change if this story in today’s Seattle Times is true. I always crack a smile when I see the collection of “flasks” for sale, as seen in today’s photo. These are glass bottles backed with a pieces of cardboard and enclosed in strong plastic wrap. And it’s not just cheap stuff you’ll see being marketed this way. I couldn’t resist and today bought a flask of calvados, an apple brandy from Normandy, something to have as a digestif. It’s a cool, windy and sometimes rainy day in Nantes today, meaning we aren’t sitting by the pool. Instead, it’s a series of little projects occupying our time. For instance, Melinda and I went into town and made it so our tram passes would not automatically renew (Line 2, forgive me). We also bought a couple of things to bring back with us to Seattle. Right now, Melinda and Ella are sorting through Ella’s school papers to see what to bring home. This prompted Chloe to start contemplating her clothes. I took today’s photo this afternoon while Melinda and I were in a little crêperie in town. Isn’t it cute? You pull on the little handle and this door hinges open at the top, revealing a secret compartment. Just what does one find inside? Garbage. Yup, “poubelle” is French for garbage. Yes, you may be asking why a word with “belle” (literally, beautiful) in it would be used for garbage. I know I am. So I looked up “pou” to see if it meant anything. Literally, it’s “louse.” Yes, the singular for lice. So the word in French for garbage translates as “beautiful louse.” Okay then. Our neighbor John, a kind man if one ever lived, invited me over for a game of snooker, a variety of pool that I’d never understood prior to meeting him. He has a table in his house and on several occasions has invited me to play. Every time I’ve accepted I’ve had a great time. John has a relaxed way about him that immediately puts a person at ease. He also is quick to offer a beer. Perhaps the two things are related, although I’m not sure which one precedes the other. No, in John’s case, I know. The kindness precedes the offer of a beer. I put my cellphone camera down on the end of the table to snap today’s picture. That’s John on the left and his step-son, Benoit, on the right. You may recall from last summer that Benoit is quite the cook. Today he was my snooker partner, while John partnered with daughter Céline. Benoit & I won the first game but gave up the ghost in the second after it looked like we had it in the bag. I think that means a third match needs to be had to decide the championship. Perhaps next week? Perhaps some of my best, and worst, qualities come from the fact that I’m a nostalgia sap. I love mining the past for good memories and then trying to recreate them. Take today for instance. We returned to the city of Pornichet, 45 minutes from Nantes by train and on the west coast, the city in which we spent two of our first four weeks in France last July. Last year, it was hot and sunny. Today, it was chilly and rainy. Instead of lying on the beach Chloe proclaimed as her own last summer, we tried to stay dry in the train station and public library. Failing at the recreating of beach memories, I took it upon myself to make the most of the day, harkening other memories. I braved the rain and went for a long walk, retracing the bike route we took regularly last year, the one from our apartment to the grocery store and to the racetrack that was under construction (it’s completed and spectacular looking – we may even get a chance to attend a race day later this month). The rain let up as I walked, helping the nostalgia win. Today’s photo is of a salted caramel crêpe from La Petite Saline, a crêperie in Pornichet that we fell in love with last summer and was part of our reason for wanting to return today. This one is Ella’s, complete with a scoop of vanilla ice cream. It was the perfect antidote to the disappointment of rain and further salve for nostalgia sappiness. When it comes to salted caramel crêpes, you can go back again. It became VERY important to Chloe that we celebrate the 4th of July in an “American” way this year. This is interesting, given that we really don’t do this back in Seattle. Well, there was that one year in Montana that the girls were in a 4th of July parade and we attended a rodeo… Anyway, she made 6 dozen peanut butter cookies yesterday, and today made sure the Bertails came over for grilled cheeseburgers. Me, I was out of the plans, having long ago decided I would be going to the horse races in Nantes today. It was my last chance since the next race day isn’t until October. Ella came with me and together we had a blast, picking different horses to cheer each race. She got the best of me in the 4th race when a horse named Sommerabend GB won. She saw the connection to Brenda & Greg, Melinda’s sister’s family, and picked this horse because of it. You can watch a replay here. Choose the 4th race (Course no 4) and you’ll see my hands in the air on the bottom of the screen near the finish (it’s the 1:52 mark and I’m next to a man in a red shirt). That’s Ella to my left. There’s a slo-mo replay of the stretch run and at the 2:10 mark you can see us clearly for about 10 seconds. Back to the dinner… Ella and I got home to find the party in full swing. Pop, watermelon, hamburgers being grilled, that sort of thing. I expected a rousing chorus of “The Star Spangled Banner” to be sung. Instead, thank goodness, Max dashed the Bertail home and came back with sparklers, much to Chloe’s American delight. Yesterday I mentioned that we were hosting the Boudeaus and the Bertails for a chocolate and wine tasting event, following the directions from a pairing kit, complete with chocolate, provided by our friends at Theo Chocolate in Seattle. I think all three couples had a great time, and it was wonderful for Melinda and me to bring together Frédérique & Laurent with Christine & Bernard. Today’s photo is of Laurent pouring one of the three wines we used to pair with the chocolate. We had a Syrah, a Merlot and a Cabernet Sauvignon. If you’re scoring at home, Theo provides five bars of chocolate, a Dominican Republic, a Rich & Dark, a Bread & Chocolate, a Fig, Fennel & Almond, and a Cherry & Almond. Frédérique and Christine were quite taken by the fact that the Bread & Chocolate actually lists French bread as one of its ingredients! Bernard & I had the same favorite pairing, the Syrah with Fig, Fennel & Almond bar. I described the combination as being nutty and liking how the flavors sat on the edge of my tongue. Christine commented how well the Cabernet Sauvignon matched with the Rich & Dark chocolate. Together, it created a kind of caramel aftertaste. I showed Laurent the Theo website and we noticed that they also provide a chocolate and BEER pairing kit. It’s too late to get that here in France but I’m plotting a Seattle party for that one. Calling Mike Quamma…. In about an hour we are expecting Frédérique & Laurent AND Christine & Bernard to arrive. Tonight we are finally hosting a party we’ve been wanting to host for months. Back in November when my parents came to visit, they brought us all kinds of goodies. Among those were some gifts from some Seattle area friends, including a selection of Theo Chocolate. You see, the son of the founders of Theo attends PSCS and his family has been very generous in supplying the school with chocolate. In this case, they sent with my parents an amazing amount, including a chocolate and wine pairing kit. So tonight, the Boudeaus and Bertails are coming to taste wine and chocolate. Yes, the living remains tough. In preparation, Melinda & I went out to Leclerc this afternoon to pick up a few things to eat before the serious tasting commences: some cheese, some fruit, and some nuts. While in the produce section I was quite taken by the display of plums (or “prunes” in French). Three different colors and absolutely spectacular in appearance next to each other. I snapped this picture with my cell phone to try to capture them. Expect another photo and more detail about the tonight’s party in tomorrow’s post. For now, I need to help Melinda get ready! So begins Day 1 of the post-sabbatical. For psychological reasons, I’ve changed the theme here on the blog and am thinking of the next four weeks, our last days in France, as a vacation that has just begun. So instead of seeing our French glass as 12/13’s empty, it is completely full. This is good. As plans stand, Melinda’s and my intention is to return to Nantes each and every July for as much of the month as we can. In fact, our Kind Living project is partially designed to help fund this annual trip to France. Think of it as a way to inspire kindness (Kind Living), or think of it as a way to pursue what one wants in life (PSCS). Either way or both, it’s the way we want to live our lives. With that in mind, we’re having another spontaneous Friday night with the Bertail family. I came home from a late afternoon walk to find three of the Bertail children in the pool, and Christine, Melinda & Chloe sitting by the pool. I quickly joined in, and before long Ella and Bernard had joined us. Théo made a trip to the bakery for fresh bread, dinner was made for the kids while the adults frolicked in the pool, and then the adults ate. Next up, a movie.